INDIANAPOLIS — It's a simple request from Indianapolis EMS, "Don't drink and scoot." But it's apparently not as simple to follow as one might think. 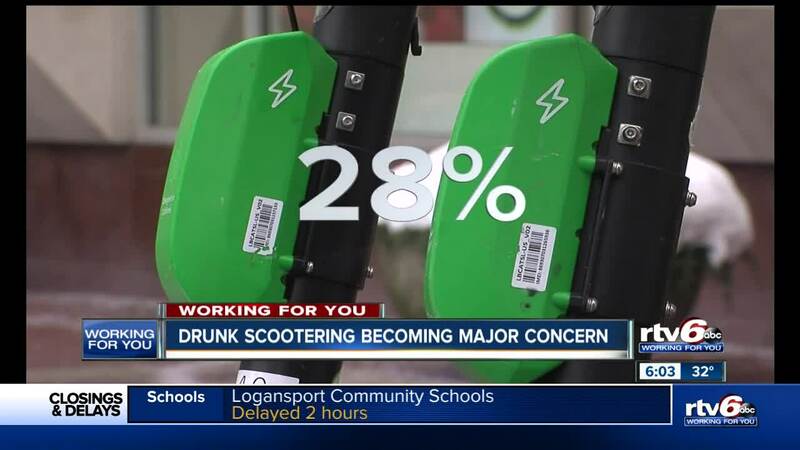 The concerns come after EMS released its numbers for 2018, showing a suprising number of people injured while riding a scooter admitted to drinking before they got on it. Indianapolis EMS started tracking scooter related injuries when the scooters returned to the streets in late summer. In 2018, they transported a total of 75 people that were injured while riding either a Bird of Lime scooter in the city. Out of those 75 people, IEMS says 28 percent admitted they had been drinking before getting on the scooter. "Scrapes, cuts, bruises, all the way up to facial injuries, shoulder injuries and broken bones," said IEMS' Brian Van Bokkelen. "It's the whole gamut." IEMS said those numbers are only a snapshot of the number of injuries because their numbers do not include any of the other ambulance providers in Marion County or anyone who went to the hospital by themselves. Van Bokkelen tells Call 6's Paris Lewbel that the numbers are concerning. He said drunk scooter driving more dangerous than drunk driving in a vehicle, because scooters don't offer any protection to the rider. Both Bird and Lime, the two scooters companies in Indianapolis, have rules that say you aren't allowed to operate a scooter while drunk, but there's no way to enforce that. 1.9. Prohibited Acts: YOU EXPRESSLY CERTIFY AND AGREE THAT YOU WILL NOT: 1.9.4. Operate any Product while under the influence of any alcohol, drugs, medication, and/or any other substance that may impair Your ability to safely operate any Product. RTV6 reached out to both companies with the numbers from IEMS, neither responded to our request to comment.